At least 49 people were killed and dozens injured in a mass shooting in Christchurch, New Zealand, on Friday, when an armed man opened fire in two mosques. Add New Zealand as an interest to stay updated on the latest news, videos and analysis of New Zealand from ABC News. The shootings were classified as terrorist attacks. "It's something we never expected to happen here," Christchurch's press secretary "Good Morning America" ​​told Gerry Brownlee. "We are a relatively small population, and while we are ethnically very different, we live very peaceful lives and this, as many have seen, has broken our innocence." A man reacts while talking on a cell phone outside from a mosque in central Christchurch, New Zealand, March 15, 2019. Brownlee, who said he lived a short distance from one of the hunting spots, said: "Almost everyone will know someone or have a connection with the families of someone who was killed or seriously injured today. " "This is one of the darkest days in New Zealand," New Zealand Prime Minister Jacinda Ardern told a news conference on Friday. Prime Minister Jacinda Ardern leaves after a press conference at the Parliament, March 15, 2019, in Wellington, New Zealand. The assassin, who was dressed in tactical equipment, appeared on live video of the shootings on social media, according to the New Zealand police. He documented his journey from his car and in the cult center in downtown Christchurch, where he opened fire indiscriminately, police said. Officials said they were working to remove "extremely distressing movies" taken on the scene and urged social media users not to share it. 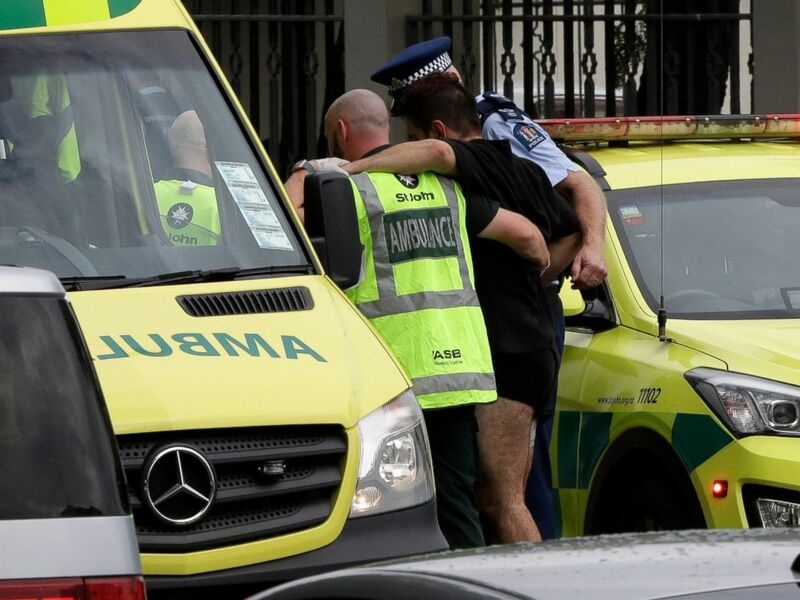 Ambulance staff take a man out of a mosque in downtown Christchurch, New Zealand, Friday 15 March 2019. A witness says that many people were killed in a mass shooting in a mosque in the New Zealand city of Christchurch. Three people are detained, including an Australian citizen. A man was charged with murder and should appear in court on Saturday, police said. The shooter also opened fire in the surrounding area outside the mosques. The police said they had recovered two improvised explosive devices attached to vehicles in the area, but were made safe. 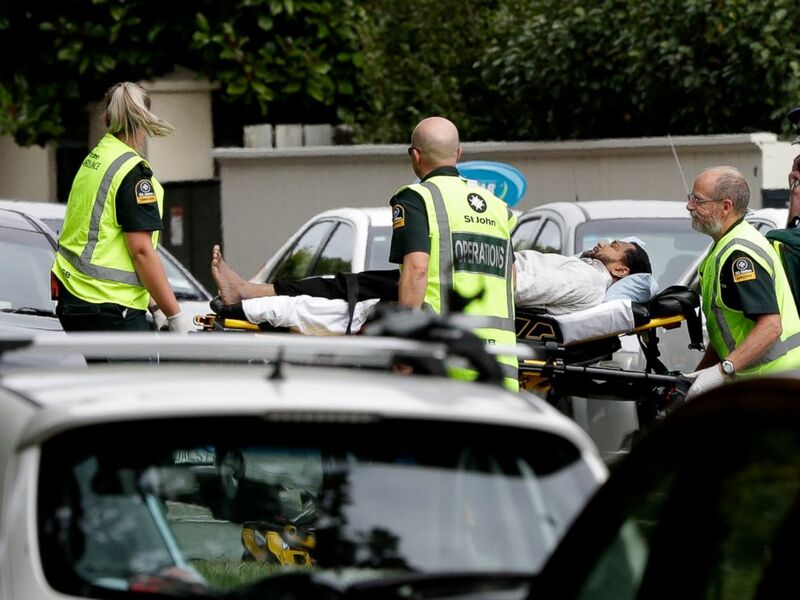 Witnesses said the attack occurred just before 1:40. local time as the sheikh held a sermon in Christchurch, which has a population of about 375,000 inhabitants. 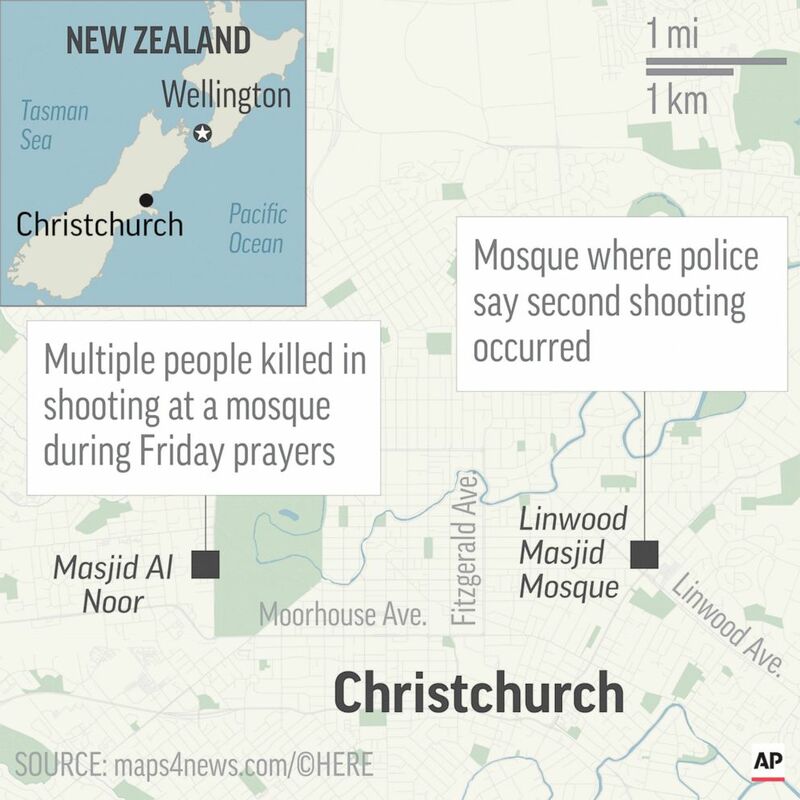 A map shows the location of two shots in Christchurch, New Zealand, on Friday, March 15 2019. "The gun starts firing and has just entered and fired ad hoc," said Ramzan Ali at the Associated Press. Arden referred to the nationalities of the victims, saying: "Many of those directly involved could be immigrants, refugees who have chosen to be here, they are us, the person who did this is not." Ali said he survived hiding under a bench. "I didn't see why I just lied under the bench, thinking that if I went out, they would shoot me," he said. "I'm just keeping my fingers crossed so I could be alive." He added: "I was the last to leave the mosque after the shooting stopped and on the doors there were many bodies". 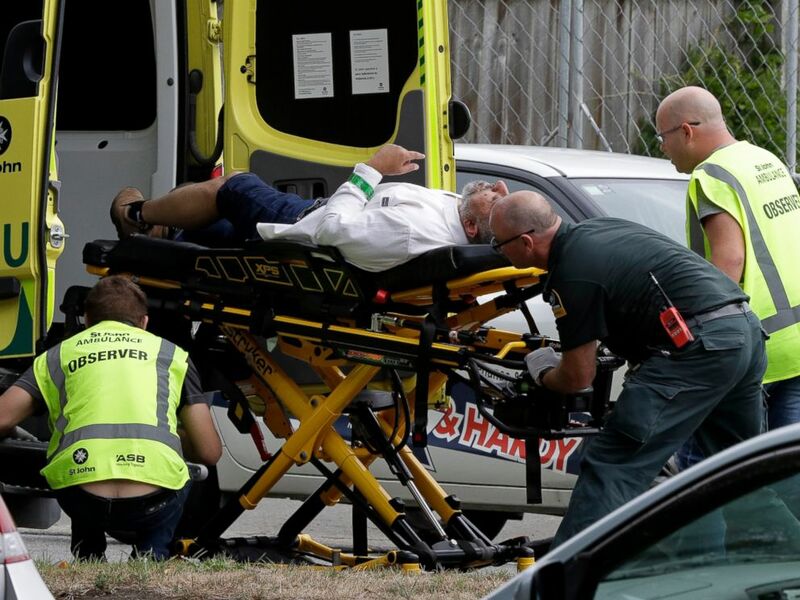 The ambulance staff brings a man out of a mosque in the ce Christchurch, New Zealand, Friday, March 15, 2019. A witness says that many people were killed in a mass shooting at a New Zealand c mosque in Christchurch. Len Peneh, who lives near one of the mosques, told the AP that "he saw dead people everywhere" when he came in to help. "I lived next to this mosque for about five years and the people are fantastic, they are very friendly," he said. "I simply don't understand." Brownlee praised the police for acting quickly and said that the most important thing now is to support those who have ties to the victims. 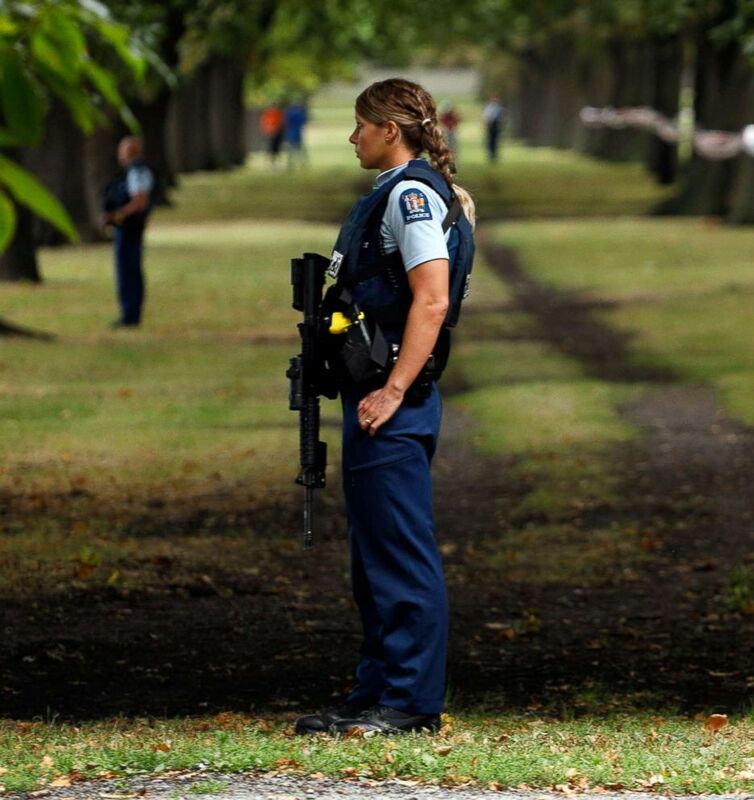 The agents of police guard the area near the Masjid al Noor mosque after a shooting incident in Christchurch, March 15, 2019. 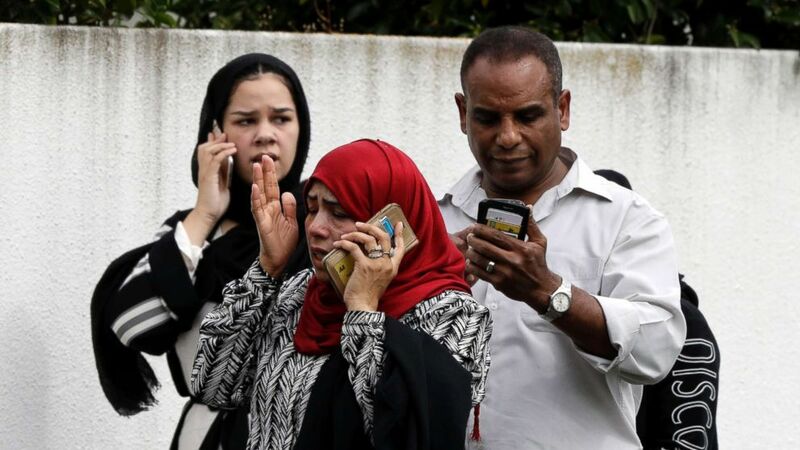 Of the 49 people killed, the New Zealand police said 41 victims died at Deans Avenue Mosque, seven at the Linwood Avenue Mosque and one in the hospital. "New Zealand is a place where people have felt very safe and very free", he added, "and this certainly shook that belief today, and we must make sure we do not end up with permanent loss of freedom that we so much appreciate . " 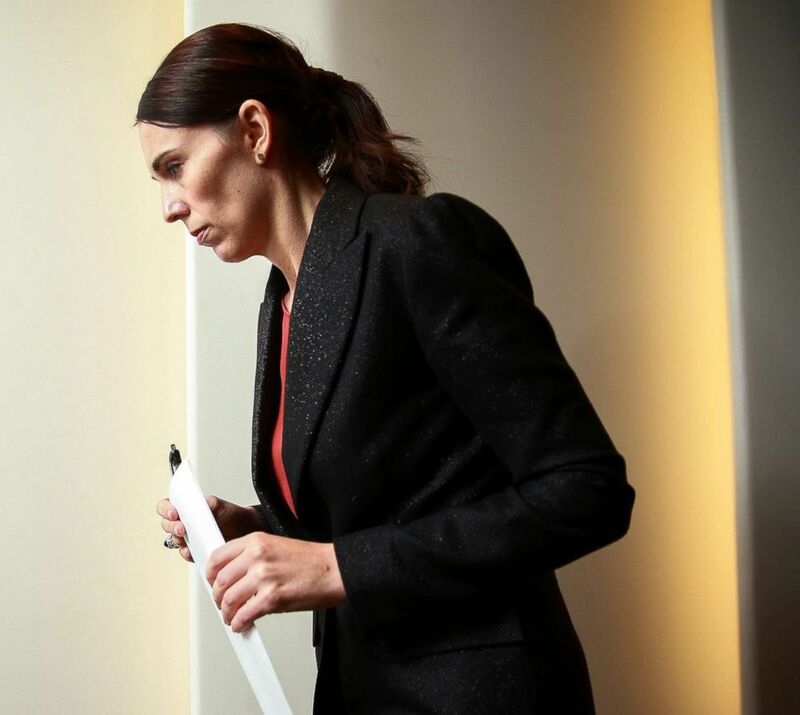 Ardern said that none of the suspects were on any active list of terrorist observers and that "it was not a question of someone slipping under the radar". Morrison said the shootings were carried out by an "extremist, right-wing terrorist who took his life – stole life – in a vicious and murderous attack that caused so many New Zealanders". Queen Elizabeth said in a statement that she was "deeply saddened by the appalling events in Christchurch". "Prince Philip and I send our condolences to the families and friends of those who lost their lives. I also pay tribute to the emergency services and the volunteers who are providing support to those who have been injured," he said. . "In this tragic moment, my thoughts and prayers are with all New Zealanders". President Donald Trump tweeted on Friday, "My warmest sympathy and best wishes go to the people of New Zealand after the horrific massacre in mosques 49 innocent people have died so senselessly, with so many more serious injuries. from New Zealand for all we can do. God bless everyone! " White House press secretary Sarah Sanders also issued a statement condemning the attacks. "Our thoughts and prayers are with the victims and their families," the statement states. "We stand in solidarity with the people of New Zealand and their government against this vicious act of hatred". Matt Foster of ABC News, Will Gretsky and Darren Reynolds contributed to this report.